This set contains: Mini Maglite® Flashlight - Metalic silver, with High-intensity white light beam from flood to spot with a twist of the wrist (with guarantee & spare globe), clip for attaching, 13 Colour Discs (Gels), Clear 6 facets Quartz Pointer (for deep tissue penetration); perfectly cut and removable (torch with colour gels can be used with or without the crystal). Insert designed for minimizing the dead orgone fields (additional feature), the whole set is packaged in a sturdy hard plastic black case. Each color is pure, ex red 630-685 nm (near infra red), and represents the peak of the wave of selected color. Natural Crystal tip - perfectly clear - it is the perfect for ear, hand, foot, face, spine acupuncture points, for balancing and/or restoring the flow of Chi (Qi) via meridians, managing pain, beauty enhancer (wrinkles, scars, etc), burns and wounds healing aid, balancing emotions, balancing Chakras, etc. "We are the children, children of the light..."
Light, whose source is solar energy, is one of Nature's greatest healing forces. In 1665, Isaac Newton beamed sunlight through a prism, and found the presence of the seven basic colors. The human body is also a prism that reflects this white light. Color therapy is the science of the use of different colors to change or maintain vibrations of the body to that frequency which signifies good health, and harmony. Healing by means of color was the first type of therapy used by humans, it is natures own method for keeping the body in balance with the rhythms of life. Color expresses the way we think. Our emotions, and actions affect the electromagnetic field which surrounds us, and is reflected in our aura. Color can help to restore balance when a blockage of imbalance of this energy has resulted in disease. The use of color can help to restore vitality to the etheric body through the projection of specific color rays, which are then absorbed by the chakra centers. The pituitary gland transforms these colors into revitalizing energies to rebuild the centers that are lacking in energy. Color healing shows us how to make light work for us. The use of color is one of the many natural tools available to help us walk in balance with Nature. The application of the correct frequency of the electro-magnetic force field will change the altered function of the body, and help return it to its original patterns. It is this energy, which is the result of applying color, that is important in the healing process. This method of healing will create harmony, and balance in the mind, and in the body. Check the meridian (or cross point; organ, gland, chakra, etc); if the energy flow is under active - use particular colour for the meridian on particular meridian point (or cross point, or directly over the organ, gland, chakra, etc) to stimulate the flow, if it is overactive; use the opposite colour to suppress the overflow. Disclaimer: Natural Remedies Haven Ltd. is not affiliated with MAG Instrument, Inc., which owns the famous MAG Family of trademarks including MAG-LITE® and MINI MAGLITE® trademarks in the distinctive shape, style, and overall appearance of its flashlights, and its circumferential inscriptions around the face cap of all of Mag Instrument, Inc.'s flashlights. Mag Instrument, Inc.'s trademarks are shown on this website for illustration only. 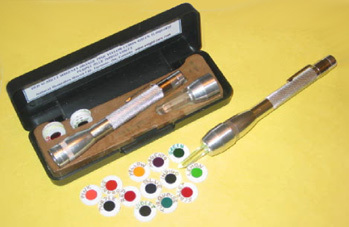 The Crystal Colour Light Balancing Set is not made, licensed, endorsed, approved, recommended, or in any way sponsored by Mag Instrument, Inc.